Do you have bitter deficiency syndrome? Is the lack of bitter-tasting foods and beverages in your life one cause of your health challenges? The bitter taste has been methodically bred out of many of our foods. Instead of bitter salad greens, the bland iceberg lettuce is our most common salad green. The once small and bitter tomato is now a large juicy ball of sweetness. And many of the digestive bitter herbal remedies that humans have relied on for a millennia have often been forgotten. As a result, our diets have become mostly bitter free. And at times it’s easy to see why. The bitter taste is admittedly hard to swallow at times. It’s no coincidence that the word bitter is both used to describe a taste as well as difficult emotions. A bitter spirit will keep you from being a better person. After being ignored and scorned within the standard American diet, bitters are now making a comeback. Herbalists have always known that some of our best medicinal plants, especially in regards to digestion, are herbs with a bitter taste. Now people from all walks of life including scientists and bartenders are embracing a new digestive bitters revolution. Researchers have shown that bitter taste receptors exist all over the body, including some places you really wouldn’t expect like the lungs and prostate. This has led to new hypotheses about how medicinal herbs and bitter tasting substances can effect the entire body. Bartenders and chefs are embracing the bitter flavor for the nuanced taste it lends to foods and drinks. Mixed drinks made with artisan digestive bitters are flooding cocktail menus and bitter salad greens like radicchio and endives are increasingly starring in starter salads. Herbalists continue to rely on bitters for aiding a wide range of digestion complaints or simply to promote and maintain healthy digestion. When you eat something bitter it revs up your entire digestive system. The bitter taste immediately increases salivation, which helps to break down carbohydrates. Stomach enzymes are increased, which breaks down food into chyme. Bitters stimulate bile production and release, which is used to break down dietary fats. Bitters also stimulate pancreatic enzymes and peristalsis. Because the bitter taste plays such an important role in a wide range of digestion, it’s no wonder that herbalists like James Green have stated that we are facing a widespread bitter deficiency syndrome. It makes you wonder how many everyday digestive complaints stem from a simple lack of bitterness. Do You Have to Use Alcohol to Have Digestive Bitters? In recent years there has been a renewed interest in alcohol digestive bitters, whether in cocktails or in digestive tinctures. I admittedly love bitters this way and have created many original recipes with alcohol bitters, including Orange and Elecampane Bitters and Artichoke Bitters (recipe found in my book, Alchemy of Herbs: Transform Everyday Ingredients into Foods & Remedies That Heal). But you don’t need to consume alcohol to enjoy bitters. Using bitters in your life can be as simple as munching on a dandelion leaf. While bitter foods are a fantastic way to get the benefits of bitters, there is something really convenient about alcohol digestive bitters. So I set out to create a tasty herbal bitters recipe using vinegar. I have to say that I’ve tasted a couple of vinegar bitters that were absolutely disgusting. Just because it’s bitter (and in this case also sour) doesn’t mean it has to be gross! 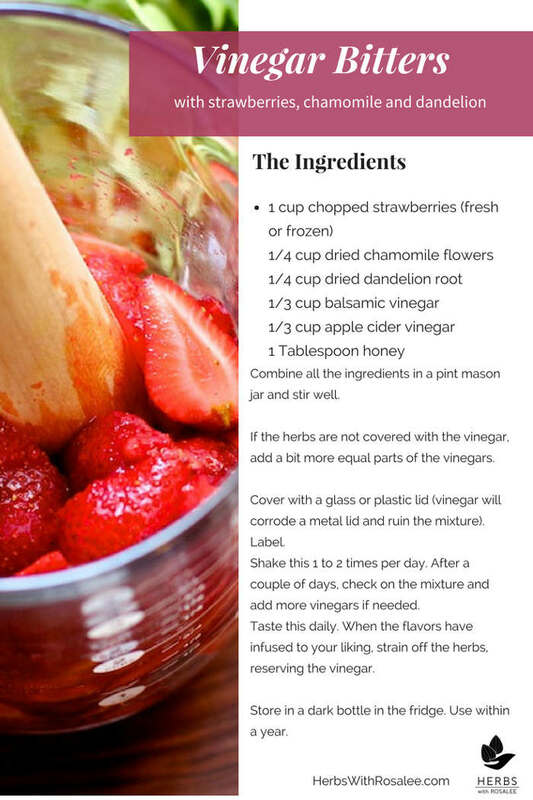 The following vinegar digestive bitters recipe can be made anytime of the year using frozen and dried ingredients. 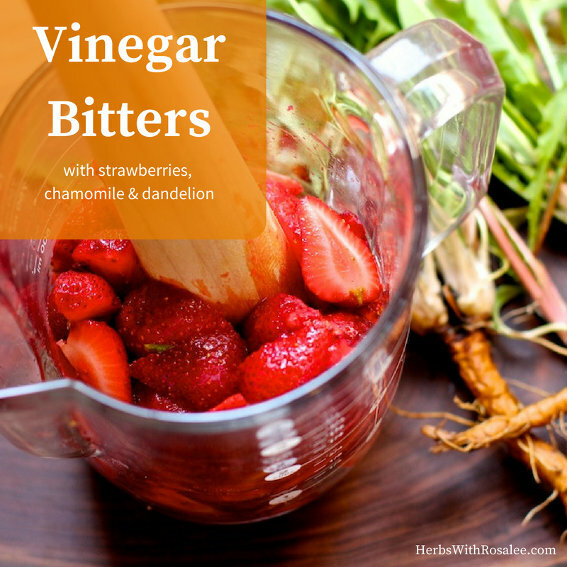 These ingredients shine in the springtime and are especially lovely when you can use fresh strawberries from the garden or farmer’s market. This is a delicious sour, sweet and mildly bitter brew. Try it in a bit of sparkling water for a refreshing summer drink. If you’d like it to be more bitter add one teaspoon of dried artichoke leaves. Combine all the ingredients in a pint mason jar. If the herbs are not covered with the vinegar, add a bit more equal parts of the vinegars. Cover with a glass or plastic lid (vinegar will corrode a metal lid and ruin the mixture). Label. Shake this 1 to 2 times per day. After a couple of days, check on the mixture and add more vinegars if needed. Taste this daily. When the flavors have infused to your liking, strain off the herbs, reserving the vinegar. Store in a dark bottle in the fridge. Use within a year.